If you are having nuisance or predatory wildlife or animal issues, problems, questions, concerns, or curiosities. Or you might happen to be searching for solutions, remedies, problem solvers, Professionals, exclusions, removals, relocation & release servicing companies … you have come to the right place. If you are in Oklahoma, and you have moles or gophers occupying your lands and yards, squirrels or bats in your attic or chimney, unwanted birds on your properties, beaver or alligators in your ponds … skunks, raccoons or opossums under your porch or house … or any other wildlife issue … please contact us today. The Oklahoma Taxidermists Association is a non-profit organization striving to better the art of taxidermy and to further educate our members. he North American Falconers Association (NAFA) is an association of dedicated members who share common views on the welfare of raptors (birds of prey) in nature and in their careful employment in the sport of falconry. Welcome to the web site of the Oklahoma Falconers’ Association. Please feel free to browse and learn more about “The Sport of Kings” as it is practiced in the Sooner state. 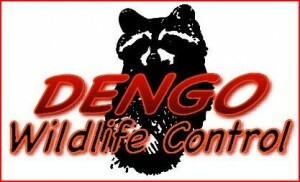 Click the Dengo Logo above to find a wildlife removal or service provider in your state. Find out what the Oklahoma Wildlife Regulations are. A.P.H.I.S. provides leadership in ensuring the health & care of animals & plants. USDA believes that no one in America should go hungry. The Oklahoma Board of Veterinary Medical Examiners as specified in Title 59 Sec. 698.1 et seq & Title 774 of the OK Administrative Code is to protect the public from the unprofessional, improper, incompetent & unlawful practice of veterinary medicine. Our Domains: These domains and some that we own but are not yet listed are for sale. Contact us for more information.